From a dank upstairs room in New York’s LGBT Center to marches on the streets of Paris, Kelly Cogswell takes us deep between the pages of the Lesbian Herstory Archive and between the frames of the documentary, Lesbian Avengers Eat Fire, Too, to bring us her insights and memories of the influential and fierce international grassroots outfit. Cogswell was among the founding members of the New York City based lesbian action group, The Lesbian Avengers, which turned into one of the most important, vociferous movements on the queer liberation front. In her memoir, Cogswell details the assembly, growth, and eventual demise of the legendary dyke activist collective. She describes this accomplished and diverse assembly of women ready to get down to business. At “the first Avengers meeting,” she admits, “I was really just there to be among girls, and to find out if I belonged. I wanted to. Anybody would.” The matter of belonging or not, reoccurs throughout the book both in personal and in larger political contexts. It is this anxiety around belonging that is evident not only Cogswell’s persistent questions about who or what is a citizen, but also in the disintegration of the Avengers. As a way to contextualize these tensions, Cogswell relays an encounter on a Brooklyn subway soon after she shaved her head. “…A bunch of black men surrounded me on the train once, asking, ‘Happy about Bensonhurst, you racist skinhead?’ Until one guy finally said, ‘It’s just her ‘do, man, like that singer,’ and they moved off…” This incident highlights the ways that difference (in this case Cogswell’s shaved head) are read and misread and how identifiers shift meaning depending on the context. Later in her story, Cogswell encounters similar questions as she struggles to unravel what it means to be a citizen of the United States, or of anywhere else for that matter. Eating Fire is a reminder, an homage, a call to rally, and a plea to this generation of queer women. Change, Cogswell seems to insist, is not only not a process any of us can afford to sit out, but that our participation as women, as queers, as immigrants, as people of color, is fundamental to our collective freedom. This book swells with astute observations about what the Internet did to and for activism and the difficulty of creating movements that are at once diverse and community-specific. While the book leaves us with more questions than answers about how we should proceed toward liberation, it does gesture toward two possibilities. First: eat fire. 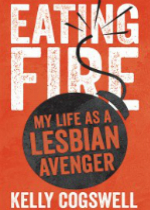 While the Lesbian Avengers actually did this as part of demonstrations, eating fire also provides a powerful metaphor not only for the total bravery of acting, but also the physical and spiritual demands of those actions. Secondly: return home. Done without an ounce of sentimentality, Cogswell provides a shard of hope in her final recalling of a trip back to Kentucky where she meets a small group of young queer locals: “We stared at each other in mutual awe. They thought it was cool I was living in New York and had been a Lesbian Avenger and had made it as far as Paris. I was impressed that they were still at home. In Kentucky. 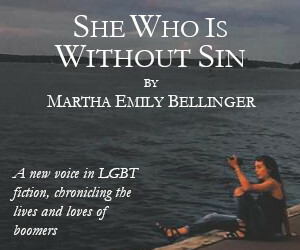 Smack-dab in the middle of the Bible Belt.” This homecoming leaves readers with the feeling that belonging and being seen are possible. 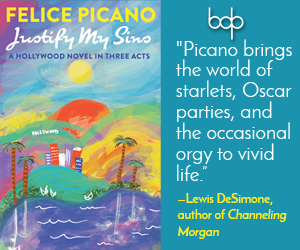 While this story is tenacious in some moments and vulnerable in others, it is always triumphant. Inspiring and absolutely heroic. This story belongs to us all. A New Jersey native, Sarah B. Burghauser writes and teaches about Judaism, queer identity, feminism, and erotica. She holds an MFA from California Institute of the Arts, where she has also taught. Sarah has worked with Semiotext(e) Press in Los Angeles and has been awarded fellowships with the Lambda Literary Foundation, The MacDowell Colony, and Vermont Studio Center. She has published with A Café in Space, the Anaïs Nin literary journal, Kirkus Media, and her essays have been collected in, Queer Girls in Class: Lesbian Teachers and Students Tell Their Classroom Stories (Peter Lang Publishing Group 2011), and photo series, GENDERQUEER and Other Gender Identitiesby Dave Naz (Rare Bird Books 2014). She lives in California.